Meeting Knives Set Is The Deadliest Puzzle I've Ever Seen | OhGizmo! 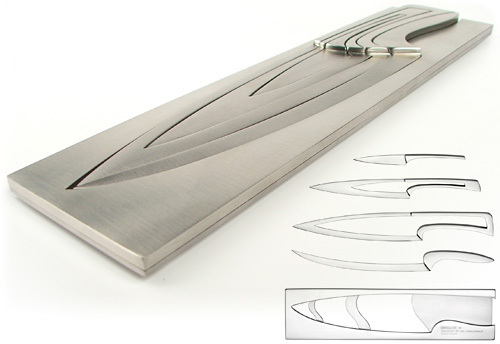 While it might look like a brain-bending puzzle, Mia Schmallenbach’s Meeting Knives set actually features a brilliant design allowing four different kitchen knives: a paring knife, a carving knife, a chef’s knife and a filleting knife to all stack inside each other on a single block of steel. The proportions of each knife were apparently determined by the Fibonacci sequence, a term I haven’t heard since my high school computer science classes, but the results are far from looking like they were designed by a mathematician. And thankfully, this is one of those times when a cool looking product is actually available for sale. The Meeting Knives set is produced by Deglon out of France, and I managed to find an Australian website called Table Direct that is selling the set for about $920. I’ve also found a slightly more affordable version that comes with a wooden base instead, available from Chef Studio Boutique for about $483. The ultimate discovery i have seen in my life. And of course it’s a knife!!! Its an amazing art and the creator is no doubt the very imaginary guy. Thanks for sharing a new idea. At first look I never noticed that this is a set of knives. Really creative puzzle. At first look you will never thought that this is a set of knives. Really creative puzzle. I ordered two sets, one for each hip. Plenty of professional chef use metal blades, Justin. If they are quality knifes,the $483 isn't too bad, but yes, these are very pricey. There is something to say for the beauty and ingenuity of it though.